The use of certified samples permits to perform periodical verification of the conformity of the reading of your hardness testers in the period between two calibrations. Periodical verification is useful considering the importance of hardness as a testing parameter. The hardness of elastomeric products is strongly influenced by the temperature. 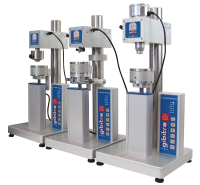 For this reason the samples produced by Gibitre have a shape that permits easy handling without transmitting the heat of the hand to the testing area. The samples are provided with calibration Certificate with traceability to the certified hardness tester used for the measurements. The samples are provide with an insulated protection case that permits the protection of the samples from temperature variations and from the light. 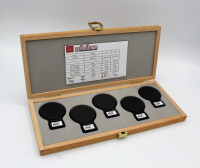 Gibitre provides samples for testing Shore A, Shore D, IRHD-N and IRHD-Micro hardness. - Box containing one single sample with one of the available hardness.